(A. vulgaris, T. montanum, A. vera, and B. vulgaris), adhered wax had a relatively homogeneous texture with almost unstructured or weakly structured surface, and wax crystals were not recognizable anymore (Figures 7.3H, 7.3J, 7.4D, and 7.4L). The waxes of most plants (B. oleracea, C. album, A. negundo, C. majus, and L. serriola) caused clearly structured contaminating coverages or homogeneous coverages with well-structured surfaces, where a few crystals or their contours may be identified (Figures 7.4B, 7.4H, 7.4J, 7.5D, and 7.5F). Waxes of I. germanica and V vinifera appeared on the setal tips as relatively homogeneous layers with numerous crystals visible on surfaces (Figures 7.3L and 7.5B). 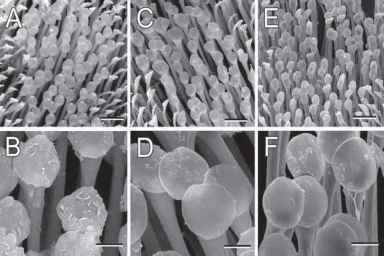 FIGURE 7.3 SEM micrographs of the pad surface in the first (A and B) and the third tarsomeres (C to L) of the beetle Chrysolina fastuosa after walking on various surfaces. (A) to (D) Clean glass plate. (E) and (F) Dust particles. (G) and (H) Leaf of Aquilegia vulgaris. (I) and (J) Leaf of Trifolium montanum. (K) and (L) Leaf of Iris germanica. S1, S2, and S3 correspond to setae of the first, second, and third type, respectively (see the text). Scale bars: 50 ^m (A); 10 ^m (B); 100 ^m (C); 20 ^m (D), (E), (G), (I), and (K); 5 ^m (F), (H), (J), and (L). spots might cover up to a half of the setal tip area (medium degree of contamination) (Figures 7.4A, 7.4B, 7.4E, 7.4F, 7.5E, and 7.5F). Waxes of T. montanum, I. germanica, A. vera, and C. album might cover the whole setal tips (strong contamination) (Figures 7.3I to 7.3L, 7.4C, 7.4D, 7. 4G, and 7.4H). In cases of A. negundo and V vinifera, wax often spread even over the setal tips' margins (very strong contamination) (Figures 7.4I, 7.4J, 7.5A, and 7.5B). 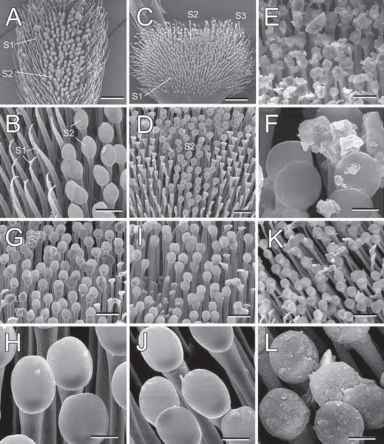 FIGURE 7.4 SEM micrographs of the pad surface in the third tarsomere of the beetle Chrysolina fastuosa after walking on various plant surfaces. (A) and (B) Leaf of Brassica oleracea. (C) and (D) Leaf of Aloe vera. (E) and (F) Ripe fruit of Prunus domestica. (G) and (H) Leaf of Chenopodium album. (I) and (J) Young stem of Acer negundo. (K) and (L) Leaf of Berberis vulgaris. Scale bars: 20 ^m (A), (C), (E), (G), (I), and (K); 5 ^m (B), (D), (F), (H), (J), and (L). (Figures 7.6A and 7.6B). A positive correlation (NS) between the portion of the setal tip surface covered with particles and the portion of setae contaminated was found (linear regression: y = 10.332+0.978*, R2 = 0.574; d.f. = 1, F = 13.502, P = 0.004, one-way ANOVA) (Figure 7.6C). The positive correlation between the two parameters was observed not only in the whole set of plant species having various types of wax crystals, but also in plants with the same crystal type, e.g., platelets and tubes. Therefore, only one of these parameters, the portion of setal tip surface contaminated, was used in our further evaluations. 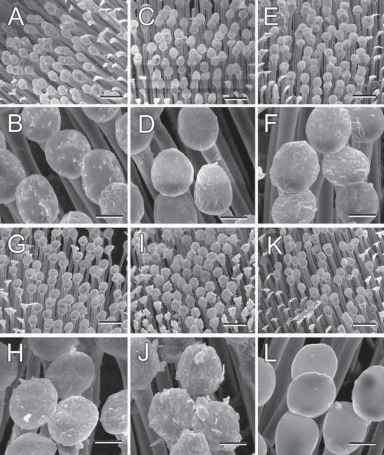 FIGURE 7.5 SEM micrographs of pad surface in the third tarsomere of the beetle Chrysolina fastuosa after walking on various plant surfaces. (A) and (B) Ripe fruit of Vitis vinifera. (C) and (D) Leaf of Chelidonium majus. (E) and (F) Leaf of Lactuca serriola. Scale bars: 20 ^m (A), (C), and (E); 5 ^m (B), (D), and (F). an increase in the largest dimension of crystals (linear regression: y = 6.112+3.955*, R2 = 0.766; d.f. = 1, F = 32.774, P < 0.001, one-way ANOVA) (Figure 7.7A). 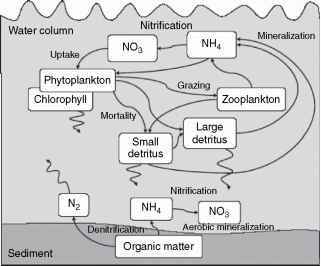 The portion of the setal tip surface contaminated correlated positively (NS) with both the largest dimension (linear regression: y = 44.013+2.509. *, R2 = 0.294; d.f. = 1, F = 4.173, P = 0.068, one-way ANOVA) and aspect ratio (linear regression: y = 41.434+0.572*, R2 = 0.313; d.f. = 1, F = 4.548, P = 0.059, one-way ANOVA) (Figures 7.7B and 7.7C, respectively).